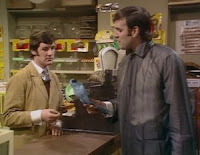 A Greek scholar has conclusively proven that the classic "Dead Parrot" sketch made famous by Monty Python's John Cleese and Michael Palin actually goes back sixteen hundred years. Hierocles and Philagrius were the original comedy duo who came up with the concept. Except in their version it wasn't a dead bird, but a deceased slave. One man complains to a friend that the slave he bought from him died not long after purchase. The friend replies "When he was with me, he never did any such thing!" Also among the 265 jokes found in the Philogelos: The Laugh Addict collection are some poking fun at marriage. One of them goes: "A man tells a well-known wit: 'I had your wife, without paying a penny'. The husband replies: 'It's my duty as a husband to couple with such a monstrosity. What made you do it?'"